When your cataract is removed, it will be replaced by an artificial, intraocular lens (IOL). There are a variety of IOLs that are used in cataract surgeries, they each have their own set of advantages and disadvantages. No single IOL works best for everyone, Dr. Deans will work with you to determine the most appropriate IOL for your needs. These are the most commonly used lenses in cataract surgery. They are excellent in quality for distance vision under a variety of lighting conditions. These lenses have a fixed focal point which is set for distance vision, reading glasses are typically required for good near vision. These lenses are used when both good distance and near vision are desired without the need for glasses. 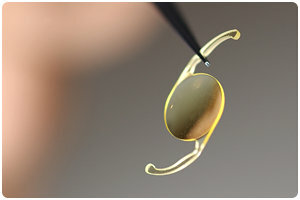 These lenses also have a fixed focal point, however, the focal point can shift position as the eyes focusing muscles move the IOL within the eye. So objects at distance are clear when the eye focuses on them, but when the eye looks at a near object the IOL will shift its focal point to bring the near object into focus. These lenses have highly specialized optical properties that can divide light to bring it into focus at more than one point at the same time decreasing your dependency on glasses at all distances. Multifocal IOLs combin the strengths of apodized diffractive and refractive technologies. Apodization is the gradual tapering of the diffractive steps from the center to the outside edge of a lens to create a smooth transition of light between the distance, intermediate and near focal points. Refraction involves the redirection of light passing through the lens, to focus on the retina.